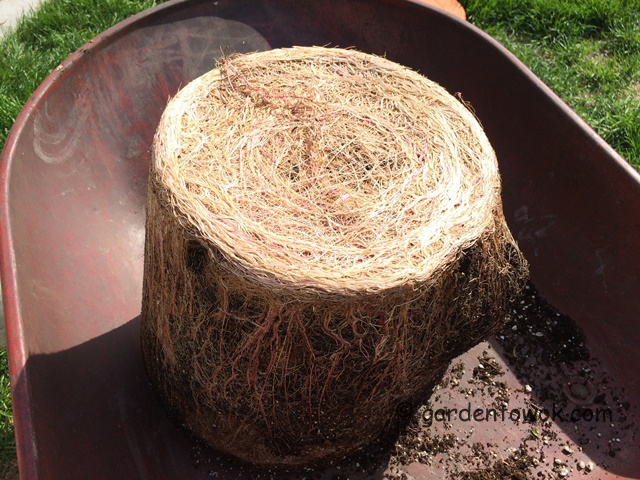 Throughout the year I had made quite a few promises to post updates about my many garden ventures/experiments. Today’s post is keeping one of the promises. 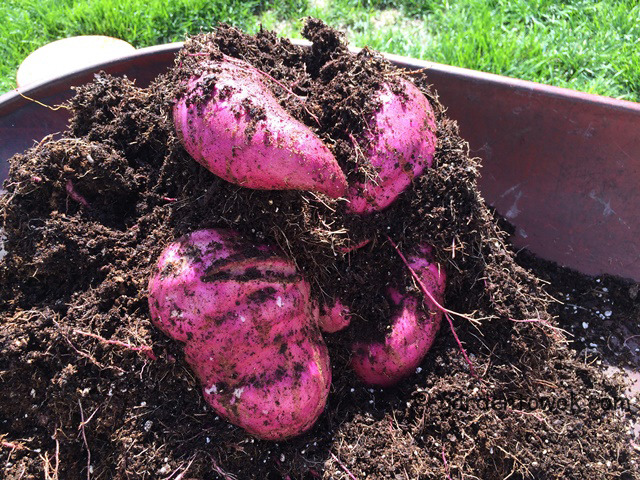 Some of you may remember the photo below (the purple sweet potato slip I planted on April 18, 2015 in a container for my daughter, Kathy, and wrote about on 4/20/15. Click on link to read post). 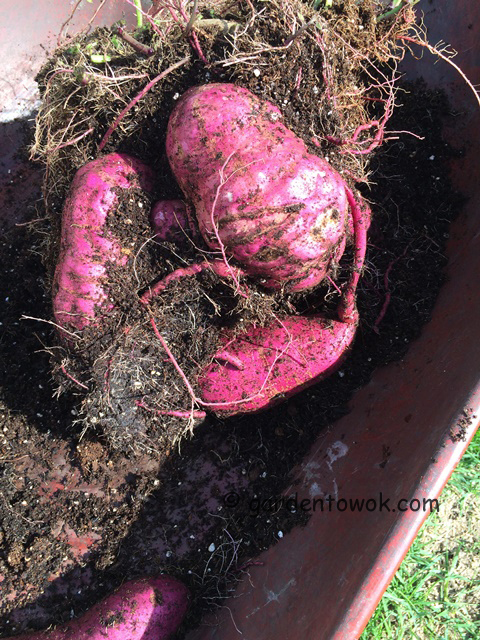 A single Purple Sweet Potato slip planted on April 18, 2015 in a 6.87 gallon (26 liter) container . April is way too early to plant sweet potatoes outdoors in the Northeast which means bringing the container into my garage every night until around late-May when the nighttime temperature is warm enough and stabilized. My daughter came for her plant around mid-May. 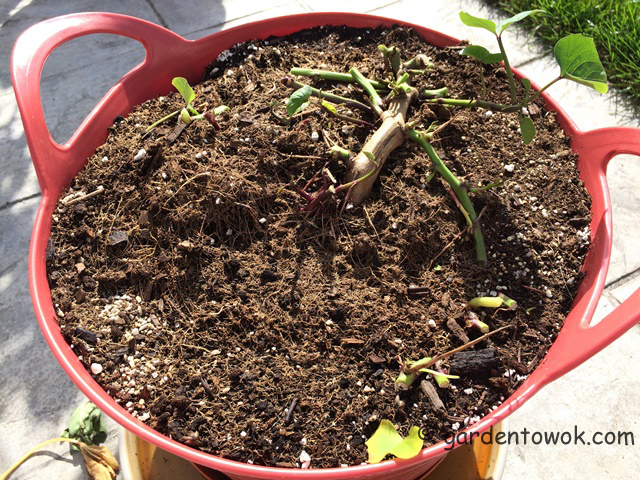 All she had to do is give the sweet potato plant full sun, water, watch it grow and harvest before frost. 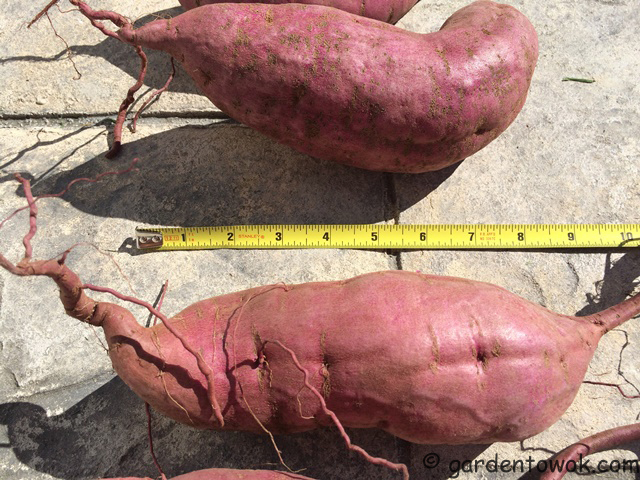 The photo below shows what that single sweet potato slip looked like on October 11, 2015 just prior to harvest. All that’s left after all the sweet potato vines were cut off. 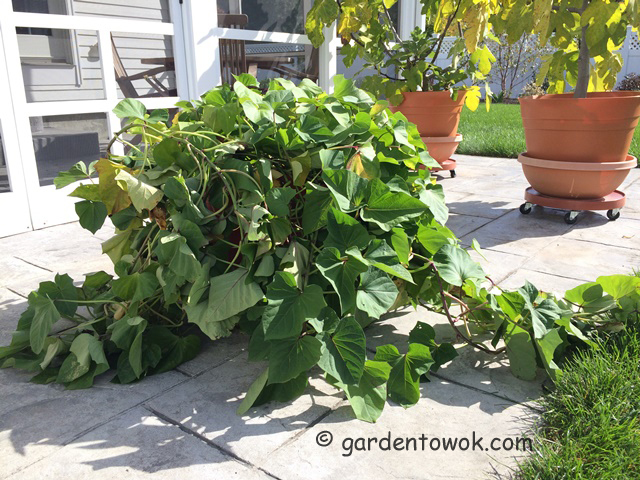 Sweet potato plant was dumped out into the wheel barrow. Bump on the right caused the container to split open. Dumped out plant reveals a ton of roots. Photo below shows what caused the bump. Sweet Potato peeking where the container split open. Yep, there was a sweet potato tuber trying to escape. It grew and pushed and split the container. Clearing away the potting mix & sweet potatoes are revealed. All of the sweet potatoes in the above photo are grown from the one potato slip. Freshly dug sweet potatoes are not sweet. They should be cured to turn their starches into sugar, curing also heals the cuts and nicks in the skin. Ideally, sweet potato should be cured at 80-85°F at 80-90% humidity for about 10 days. Personally, I place my cleaned sweet potatoes in a newspaper lined container, cover container with a clean dish towel and place container in my utility room. Since I do not have the ideal environment, my sweet potatoes take longer to cure, 2-3 weeks. I do check occasionally and remove any that show signs of decay. Once cured I store them in the basement where the temperature is about 60°F. Two of the 4 large straight ones. This strangely shaped monster weighed 4 lbs 5 ounces. What caused the above sweet potato to grow like that? CONCLUSION: Growing sweet potatoes in container is doable. 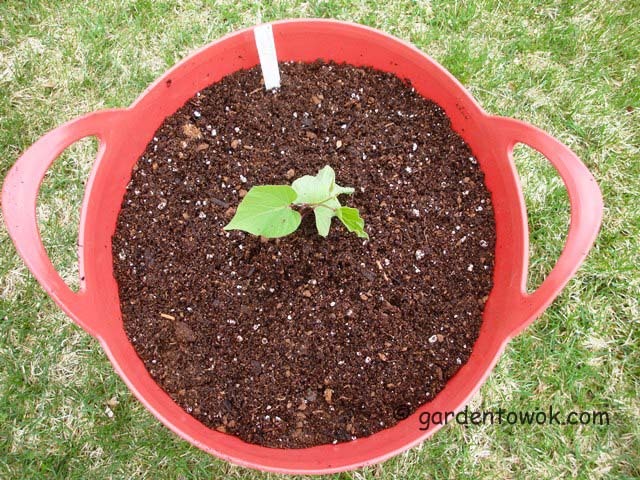 ∗ Fill container/tub with a good potting mix and/or compost. 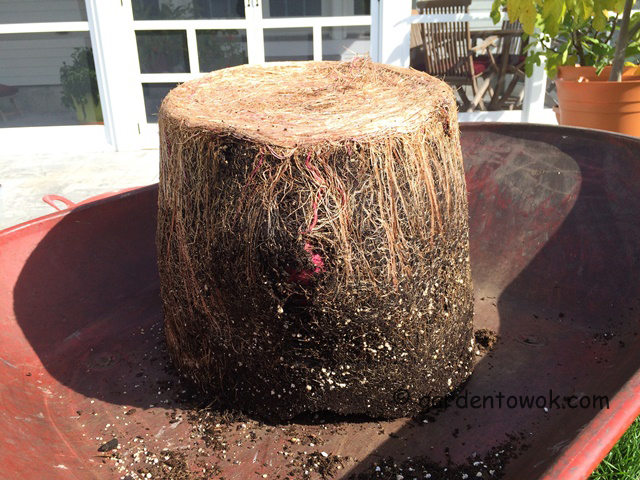 Add some peat moss as sweet potatoes prefer a low pH. Grows best with soil pH between 5.0 to 6.0. ∗ Only one slip in each container. Give the plant full sun and do not allow soil to dry out. 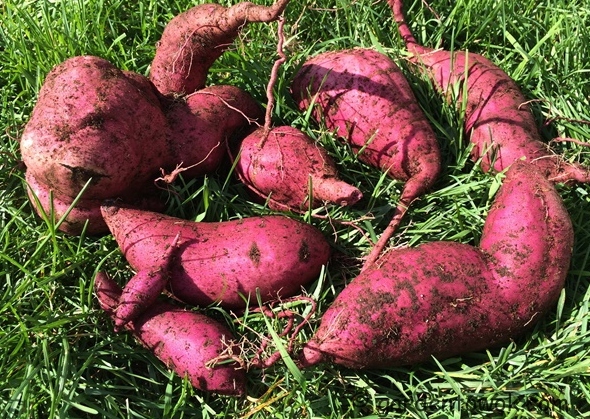 WONDERING: Since purple sweet potatoes is a short season variety (90 days) would planting the slip in May instead of April give the same result? NOTE: My very organized and methodical daughter took all the photos (except the 2nd one) and made the notes. 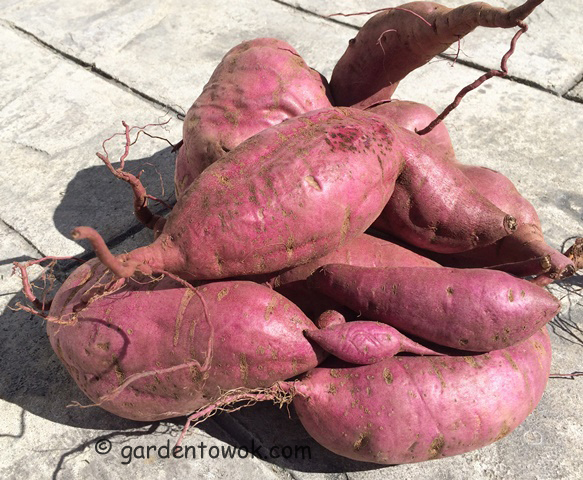 This entry was posted in Container gardening, Growing sweet potatoes, Harvest Monday and tagged curing sweet potatoes, growing sweet potatoes, purple sweet potatoes, storing sweet potatoes. Bookmark the permalink. Sorry to learn you did not get a good sweet potato harvest, SP do need full sun. You may also want to plant short season varieties. I am so jealous!! Those red sweet potatoes are amazing! The flesh of those sweet potatoes is a pretty purple. That is amazing Norma! And proof you can grow sweet potatoes in many areas if you give them the long, warm growing conditions they need. That fig harvest is impressive too. Both my daughter and son-in-law were surprised to find that many sweet potatoes in the one container. 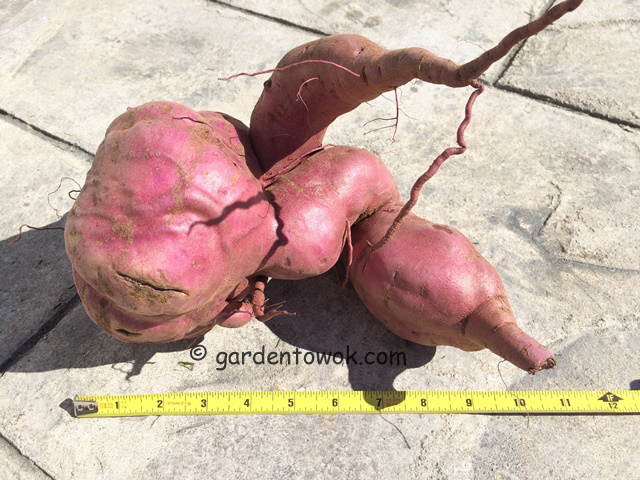 I never knew you had to cure sweet potatoes – so interesting and love that you can grow then in a container. You are not the only one my daughter did not know either. A beautiful week to you too. I cannot believe that you were able to harvest to many sweet potatoes from a single container. I also didn’t know that you needed to cure the tubers in order for them to become sweet. You never fail to teach me something, Norma. Thank you. I was surprised too. We learn from each other. Wow – that was a much better haul than I had! I’m definitely going to try again next year, however, and this time I WILL remember to keep the container well watered! How big was the tub that you used? The tub is 6.87 gallons (26 liter), about 15 inches in diameter and about 12.5 inches tall. Did you plant a short season variety? I have no idea, Norma – I used potatoes from the grocery store as we don’t have ready access to sweet potato seed unless we order huge quantities are pay a LOT for shipping. The one good thing is that they were locally grown, so I’m assuming that if the local farmers can grow them, so can I! I agree, if the SP was locally grown then you should be able to grow them in your garden. Wow! I grew sweet potatoes in Florida once and didn’t check soon enough and they were the size of Volkswagens. That’s a wonderful bucket of sweet potatoes! You got me thinking, what if my daughter had felt around in the potting mix and remove the large tuber would doing so disturb/affect the remaining tubers? Hi, Norma- What a great post! So cool to see the transformation from the single slip at the beginning of the season to the step-by-step harvest at the end– a beautiful demonstration of the concept of “yield”. Your descriptions and information are perfectly complemented by Kathy’s photos– great job to both of you! And no sign of chipmunk or voles chewing on those sweet potatoes! Thanks, compliments from you means a lot to me I will forward your happy read comment to Kathy. It was a fun post to write. The advantage of growing crops in containers – no chipmunk or voles damage. You are welcomed. Glad you enjoyed my SP post. Would love to learn about your result when you try growing SP in container. I knew one could grow sweet potatoes in container but did not expect such an impressive harvest. Will be conducting more containers experiments in the future. They will just take longer to cure. I do not have the ideal conditions for curing my sweet potatoes that’s why mine take longer to cure, 2-3 weeks. I didn’t know about curing the sweet potatoes but it makes sense. Apples have to turn from starch to sugar over a period of time to be sweet enough to pick. I didn’t know that apples turn from starch to sugar on the tree, learned something new, thanks.